Whether you call it a smartphone, a tablet or a phablet, we think we can all agree that the Samsung Galaxy Note 2 is not for the average jeans pocket, so some portable protection is a wise investment once you've got your hands on one. If you love that slim Note 2 body and want to keep it in near box-fresh condition for as long as possible, then a phone/tablet/phablet case is an essential investment that won't break the bank but could save you from having to pay for expensive repairs if you drop it. 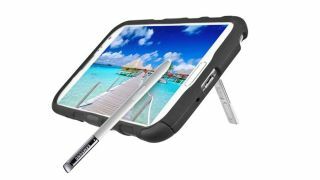 Here is our pick of 15 of the best Samsung Galaxy Note 2 cases to buy. Offering a Note 2-hugging fit and a rubberised anti-slip design that makes it easier to grip your device, the TPU case should keep greasy fingerprints to a minimum and offer decent impact resistance. There's access to cameras, speakers, volume and ports, all housed in a slim body. If you are taking your Note 2 out for a run, this water-resistant - and more importantly, washable - neoprene sports armband will hold your phablet comfortably and securely in place with an adjustable closure. An internal pouch also means that there's enough room for some change and a key to get back into the house. Adding just over 2mm of thickness, the hinged leather case is made with a Plextonium frame and a micro-suede lining that offers better resistance against scratches and drops. It also comes with a screen protector and microfibre cloth to buff that display up. It can also be opened up as a landscape viewing stand, enabling you to watch movies without having to keep hold of your Note 2. Primed for video-watching Note 2 users, the Active case comes with a built-in magnetic kickstand that enables you to watch in landscape view hands-free. Despite its thin exterior, a dual layer of polymer and a rubberised exoskeleton means it's well guarded against impact, and also makes it easier to grip. Crucially, ports are all accessible once inside the case, which means you can be creative without taking it out from its protective shell. Making sure that slender body is not all hidden away, this hard shell polymer case fits on the back and sides of the Note 2 and features an interior lining to ramp up the resistance against drops. The lay flat bezel will help protect the screen when you lie it down on a table, and it's available in white to complement your brightly hued Note 2 - or alternatively you can get it in black or pink. Pop your Note 2 inside this durable rubber case which is available in Raspberry and Cool Grey or Black and Slate and it will provide a hard outer shell and a shock-absorbent centre to give enough everyday protection. A raised bezel will help keep the screen out of harm when lying flat, while rubberised button covers should give it a nice sturdy grip in the hand. Maintaining the Note 2's slender looks and at the same time keeping it in one piece the Commuter's dual layer protection comprises a polycarbonate outer and silicone inner layer to battle drops and scratches. If you want the display looked after as well, carefully apply the self-adhesive screen protector provided as a last line of phablet defence. This official Samsung case swaps places with the battery cover to guard the 5.5-inch display against getting scratched or dirty when you are on the move. By covering the whole of the front, it stops you from accidentally pressing buttons or swiping, and with an NFC chip built in it means you can still share images and videos by tapping it against another Note 2 and not worrying about pulling the cover off first.